It’s Day 305! I have a show tonight and had only a few hours of sleep last night…so I finished my piece early so that I can take a little nap and relax a bit today. Join me in honoring Invader today! 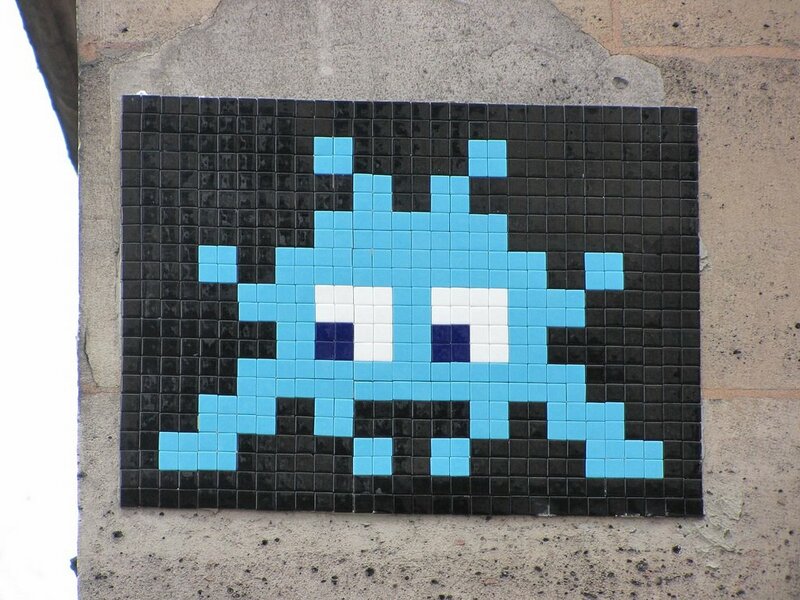 Invader is the pseudonym of a well-known French urban artist, born in 1969, whose work is modelled on the crude pixellation of 1970s 8-bit video games. 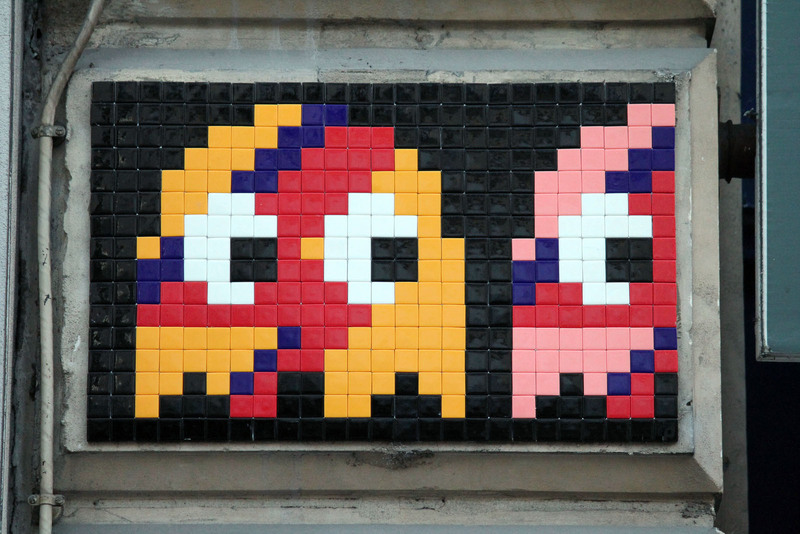 He took his name from the 1978 arcade game Space Invaders, and much of his work is composed of square ceramic tiles inspired by video game characters. cities in 30 countries. He documents each intervention in a city as an “Invasion”, and has published books and maps of the location of each of his street mosaics. 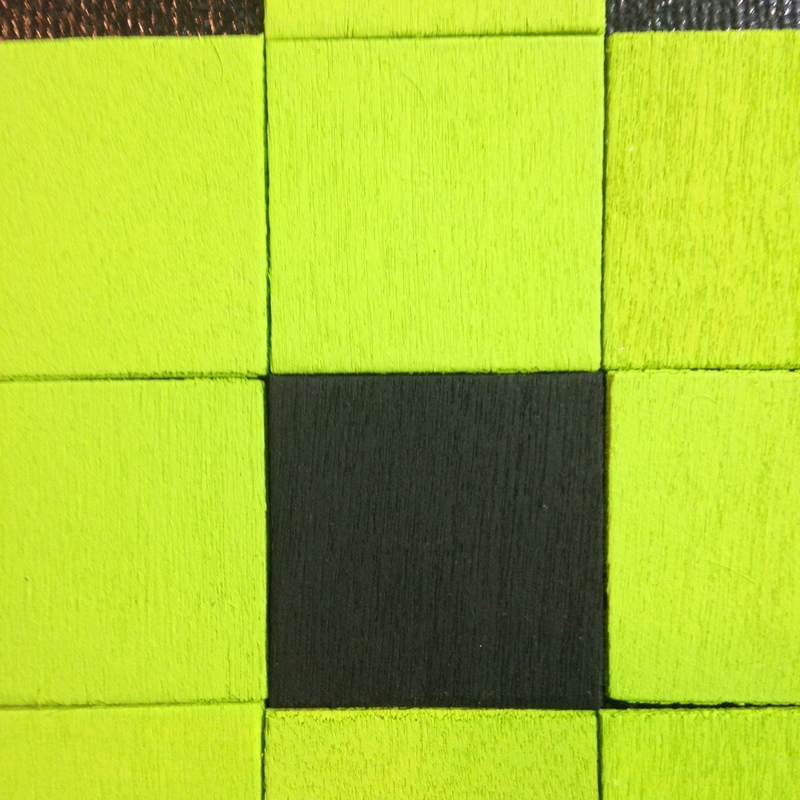 In addition to working with tiles, Invader is one of the leading proponents of indoor mosaics created using stacks of Rubik’s Cubes in a style he refers to as “Rubikcubism”. 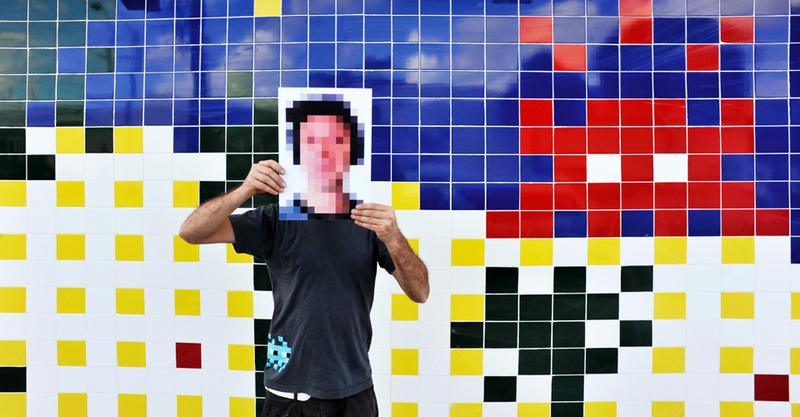 He is also known for his QR code mosaic works. 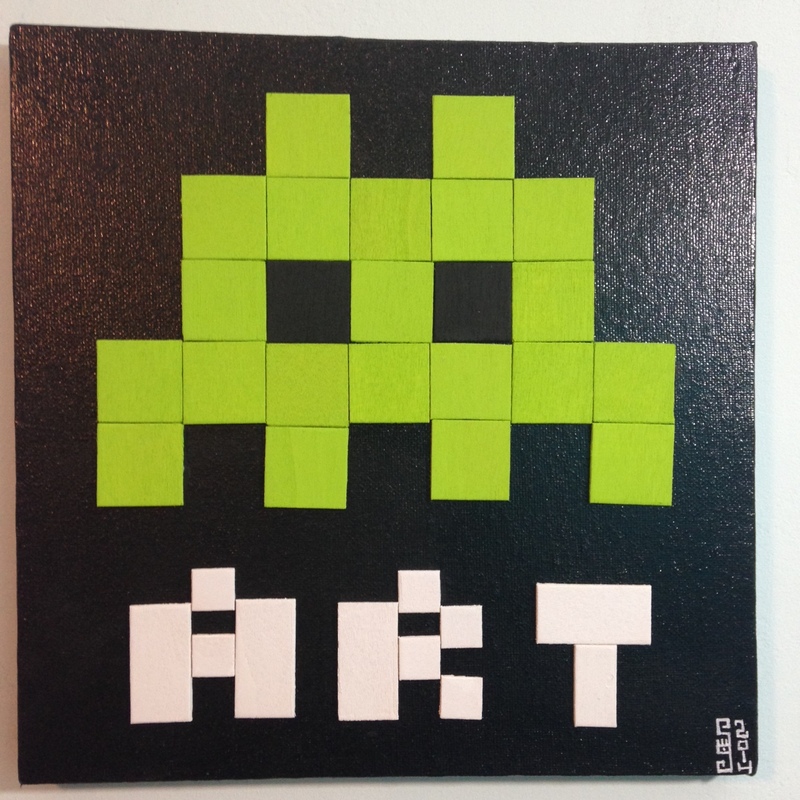 As a graduate of the École des Beaux-Arts, or Tiling School on Mars, Invader initially derived inspiration for his creations from video games from the late 1970s to early 1980s that he played when he was growing up, particularly characters from Space Invaders, from which he derived his work name. Games of the era were constructed with 8-bit graphics, and so lend themselves well to the mosaic treatment, with each tile representing one pixel. 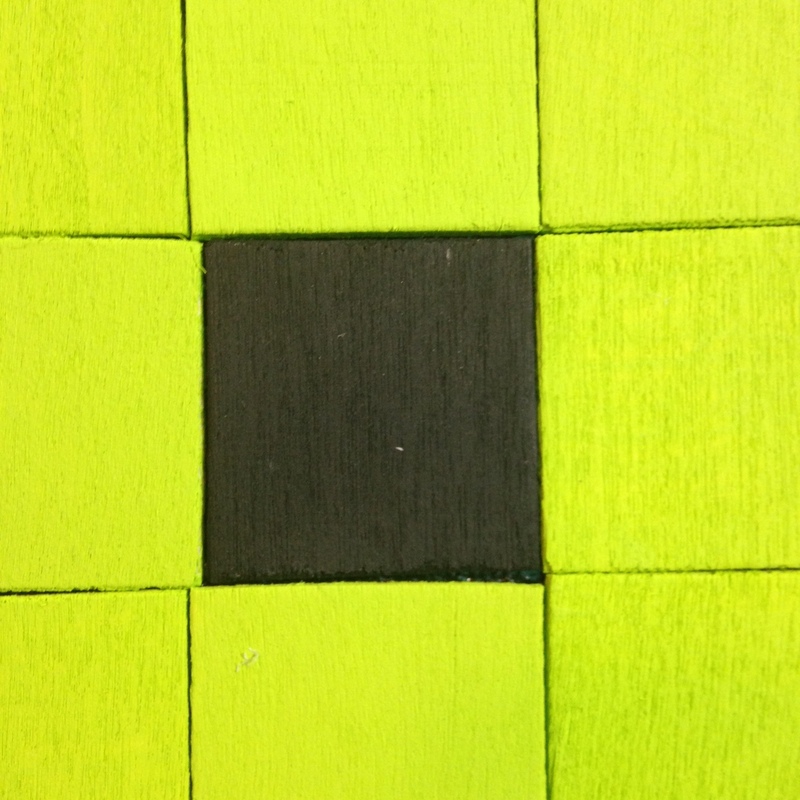 Invader likes tiles for their robustness and permanence. 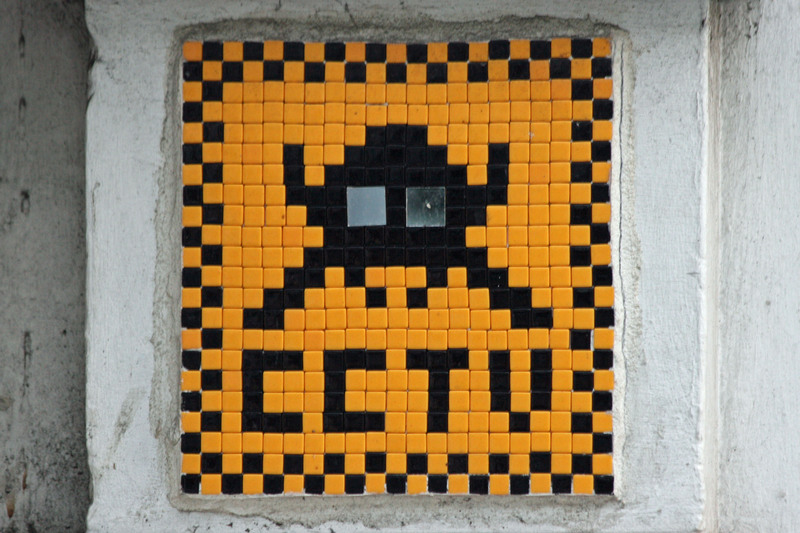 Invader’s first mosaic was installed in the mid 1990s in his home city. It was a sleeper for several years before the full “invasion” programme was conceived in 1996. In this project, the idea is to bring the virtual world into reality. One can see many things in it, but it refers to the early days of digital and the video game. occasions. He has tagged historic buildings and other locations. One of the more prominent places where the mosaics have been installed is on the Hollywood Sign. The first was placed on the letter D on 31 December 1999 to mark the Y2K bug. During subsequent trips to Los Angeles, Invader placed mosaics on the eight other letters of the sign. 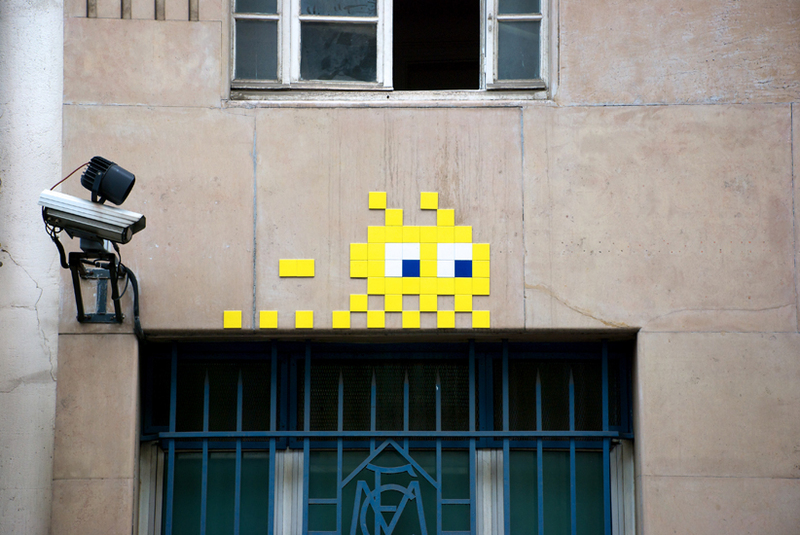 In June 2011, Invader marked the installation of his 1000th work in Paris with an exhibition at La Générale entitled “1000”. Since 2000, the artist has installed in excess of 70 pieces of work dotted around Hong Kong; the artist has declared the third wave undertaken in city, with 50 works, “probably my most accomplished city invasion wave”. 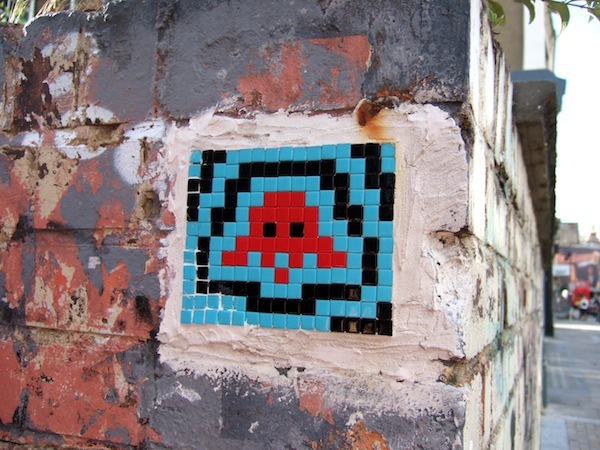 By June 2011, 77 cities have been invaded, 2,692 Space Invaders placed comprising some 1.5 million ceramic tiles; 19 invasion maps have been published. 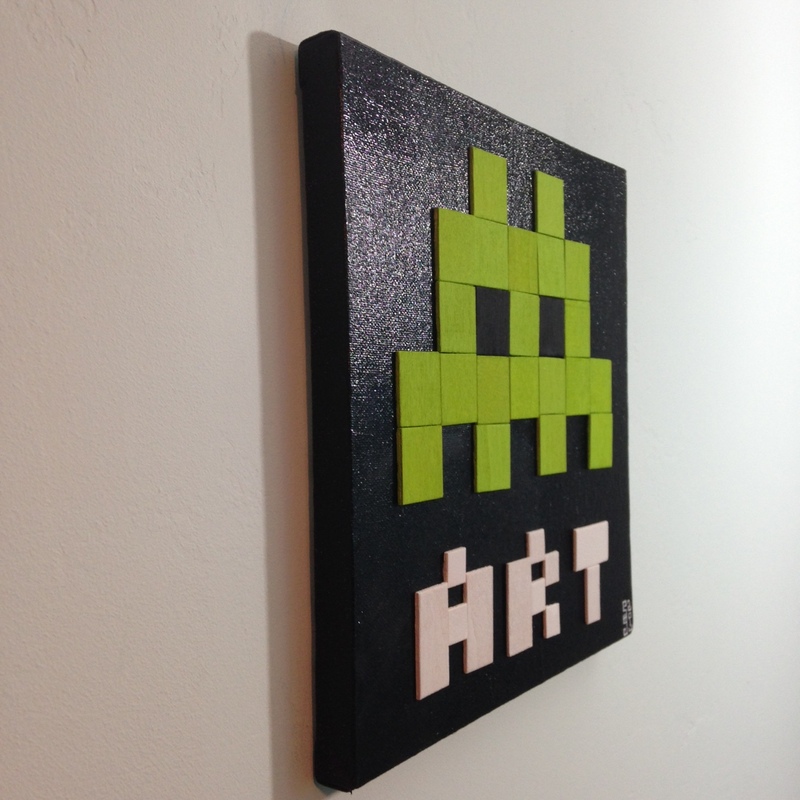 Invader estimates that more than 15% of his early pieces, ones that were small and placed rather low, have been removed. To combat their removal or damage by building owners, thieves or fans, Invader places many out of easy reach. installed on smart phones. One decoded message reads “This is an invasion”. Invader works incognito, often masked and largely at night. To guard his anonymity, he pixellates his own image or wears a mask as a disguise for interviews. He claims that only a few people know his real name and his face, and that even his parents think he works as a tiler in the construction industry. By June 2011, Invader had travelled around the world six times and spent 22 nights in prison cells. Invader accepts arrest as an occupational hazard. He was arrested in 2010 for placing a mosaic on the Hollywood sign, charged with vandalism and made to pay a fine. 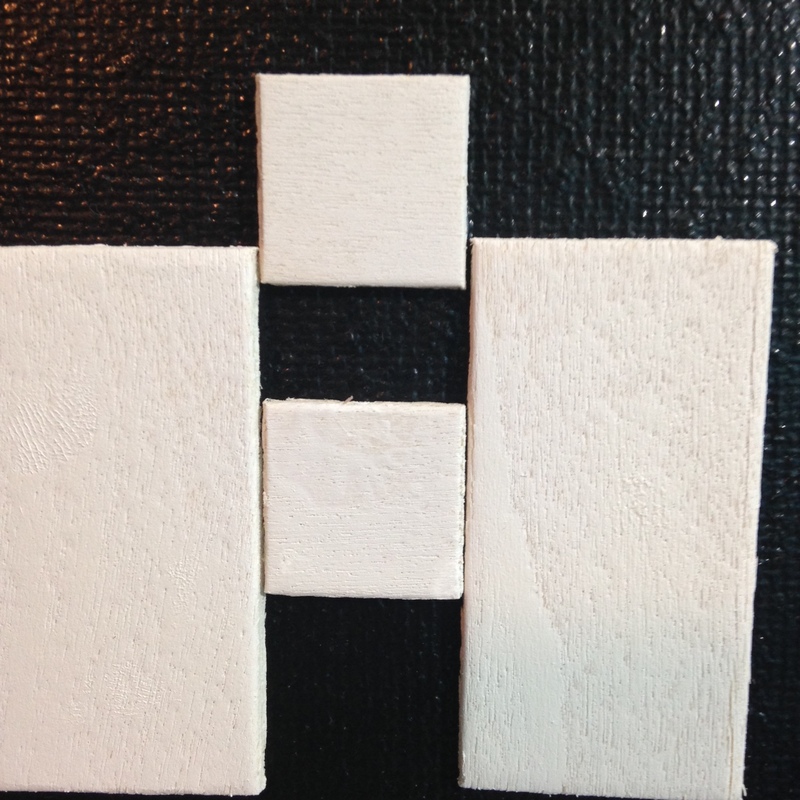 In July 2011, the Los Angeles Police Department detained two French nationals on suspicion of vandalism near MOCA’s Little Tokyo gallery with tile and grout in hand. The police asserted that one of them was Invader, but released the pair without charge. He was also arrested by plain-clothed police in October 2013 in New York, just as he had completed installing a mural in Orchard Street in East Village in the early hours. 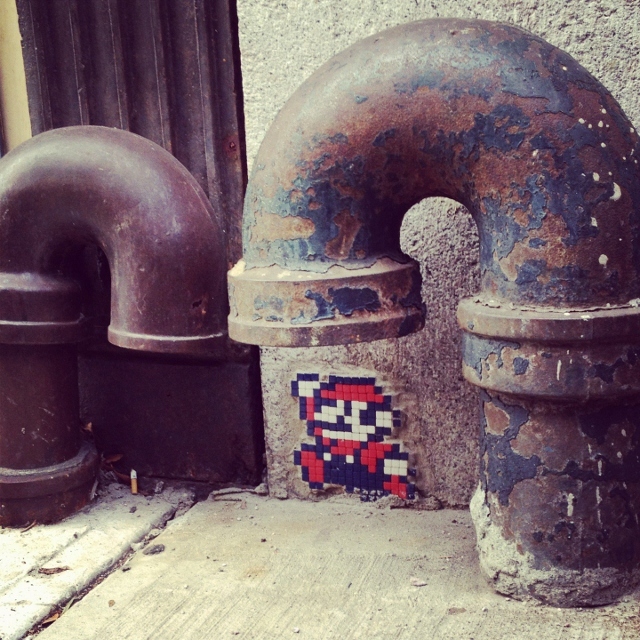 He was again fined; the owner of the building took down the work featuring Princess Peach and had it preserved. Invader said that whilst creating installations he had been accosted by police in Hong Kong, but was left alone once they realised he was not committing any crime. them at street level for ordinary people to enjoy on a daily basis. Man(Paris). Sites near major bank buildings are marked with dollar sign mosaics. His works in Hong Kong have a more oriental theme: with some martial arts characters; gold and red colours have been employed more often to reflect the traditional Chinese colours for fire and earth. Typically, mosaics are placed ten to fifteen feet above the ground, and on street corners in areas of high visibility. He has developed methods and techniques to attain those potentially dangerous and hard-to-reach locations. Invader unveiled a massive Spider-Man (PA 1040) very high up in the 11th arrondissement April 2013. 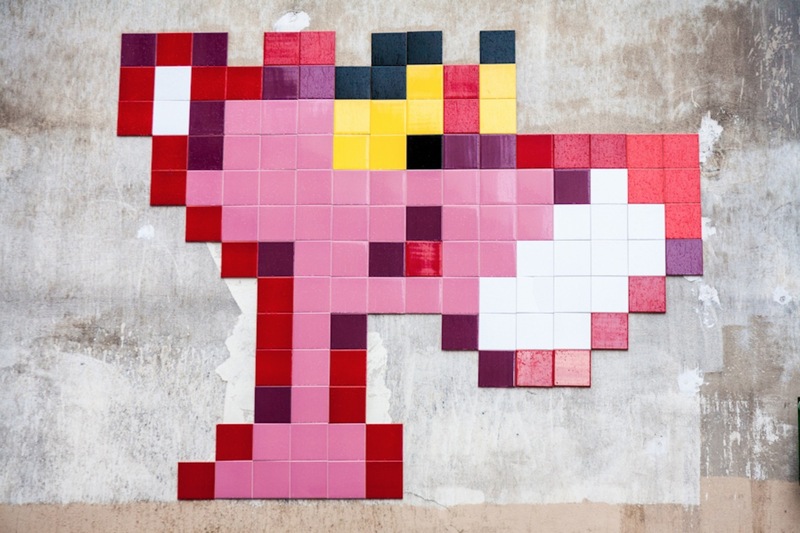 In his invasion of Hong Kong in 2014, he planted mosaics that featured Hong Kong Phooey, Thomas from Kung-Fu Master and Popeye. 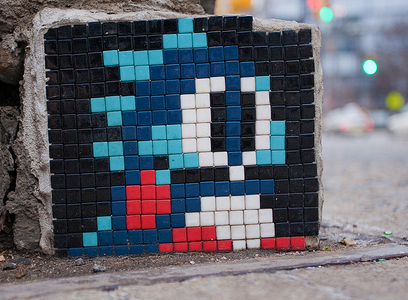 Invader has said: “I don’t know what ‘holidays’ means because anywhere I go, I can’t resist bringing tiles and cement with me.” His mosaics are half-built in advance. The weight and fragility of the tiles are constraints that influence his planning and site choices. When Invader arrives in a city, he usually stays in a city for two or three weeks. He obtains a map and spends at least a week installing the mosaics, which are catalogued (each given an identifier with the city code and sequential number), photographed (one close-up and one in its context) and mapped to indicate their locations within the city. He prints and distributes “invasion maps” within the city he is visiting, and they are later sold in his on-line shop. In Montpellier, the locations of mosaics were chosen so that, when placed on a map, they form an image of a giant Space Invaders alien. be the originator, and is certainly one of the foremost proponents of the art form he calls “Rubikcubism”. 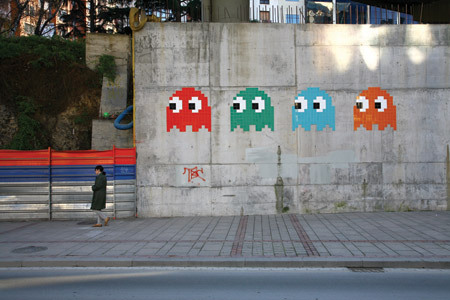 Invader takes an image from popular culture, uses a computer program to work out the precise disposition of the six colours for each image. He then manipulates nine pixels for each Rubik’s Cube to give the required pattern – taking perhaps ten seconds per cube, constructs a full image by stacking them, after which the cubes are glued to a backing board. A piece typically composed of approximately 300 cubes, measures about 0.9 by 1.3 metres (3 ft × 4 ft), and weighs approximately 36 kilograms (80 lb), but the exact size depends on the subject and the desired level of detail. The works are themed along three axes: “Bad Men”, where he reinterprets villains such as Osama bin Laden, Jaws and Al Capone; “Masterpieces” where famous paintings by artists such as Delacroix, Warhol, Seurat, Lichentenstein are given a workover; and “Low Fidelity” based on iconic album art such as Country Life, The Velvet Underground & Nico, and Nevermind. He has created images of the Mona Lisa and the Dalai Lama with this technique. He received a lot of attention for the 2005 portrait of Florence Rey he made with the technique, which has since been much imitated. Melbourne, Los Angeles, New York City, London and Rome. Space Invader has shown in many galleries, art centres and museums, from the 6th Lyon contemporary art biennale (2001), the MAMA Gallery in Rotterdam (2002), at the Paris based Magda Danysz Gallery (2003), at the Borusan Center for Culture and Arts in Istanbul, Subliminal Projects in Los Angeles (2004). In 2010, he was one of the featured artists in the Banksy production Exit Through the Gift Shop shot by Thierry Guetta (Mr. Brainwash), Invader’s cousin. In 2011, he took part in the MoCA LA show at the Geffen Contemporary : “Art in the streets” curated by Jeffrey Deitch. His work, when sold in galleries, often fetches six-figure sums. Invader’s pop art may seem shallow, but by taking the risk of illegally re-contextualizing video game characters in an urban environment that provides more chaotic social interaction than a gamer’s bedroom, he makes a statement about the desensitizing nature of video games and consumer culture. In a postmodern paradox, a game like Grand Theft Auto takes the danger of the streets and puts it in a safe video game, while Invader takes a safe video game icon and inserts it into the danger of the streets. that month, taking down a roadside mosaic in Fortress Hill “to ensure safety of road users”. Local residents were disappointed, and saw the removal as an example of the government only paying lip-service to promoting the arts in the city. The artist expressed his sadness, saying he “never faced a situation where a public authority would systematically and rapidly remove the art from the streets”. I had such a fun time with today’s piece! I hope you enjoy it. I will see you tomorrow on Day 306.